1/8 cup Arame and/or Hijiki seaweed. A little goes a long way. 1. Soak the seaweed in a medium-sized bowl for 20 minutes. Drain the water and rinse. 2. Put the seaweed in a large skillet with the water. Add the peas, carrots, mushrooms and onion. Cook on medium until the seaweed is soft, about 10-15 minutes. Add soy sauce at the end of cooking, stir throughout. Cook millet the same as you would most whole grains with a 1:2 ratio of grains to water. You can add any flavoring or spices you like. I just like it plain with a pinch of salt. The buttery-yellow natural color is as rich in flavor as it is in color. 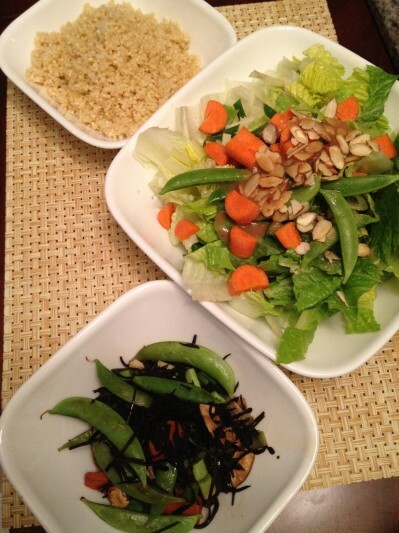 Let us know what you think of this easy vegan recipe: Seaweed Stir-Fry over Millet!